When rap was first popular I didn’t really get into it. I was more of a sappy love song/top 100 kind of gal mixed with a bit of heavy metal from my pool hall nights and some folk from my girl power days. Looking back the rural white suburban kid I was just wasn’t ready to understand the power of rap lyrics — they were too far from my experience. Over the years I have spent a lot of time wondering if I could like (even love) rap under the right circumstances. The answer is yes, absolutely yes. I don’t like to jump on any bandwagon but I just can’t help it with Hamilton, the musical by Lin-Manuel Miranda. It turns out that historical rap is my gateway drug. If I hadn’t elected to be an English major I could have easily picked history. I love learning about the long arc of human experience and knowing that nothing is truly new. History is big, but at the base it is made up of people, people living their lives alone and in groups. So, even though I couldn’t pull off better than a B+ in any college-level history class (too many facts to memorize), I registered for one a year any way. I left the facts in the textbooks, what I brought with me were the big questions and answers. Like why Aaron Burr would demand a duel from Alexander Hamilton, two members of the same political party who had known, respected and worked with each other for years? Miranda does such a great job setting forth that big question that I’ve had four lines on a loop in my head since I started listening to the soundtrack. Fools that run their mouths off wind up dead. The stanza, coming in the early part of the musical, sets the stage for how two men with such similar politics could become lifelong rivals. Hamilton lived out loud, speaking and writing at length about his politics and opinions worrying little about the ramifications. Burr lived in privacy, choosing to keep his life and politics close and using his winning personality to gain influence. As I’ve been singing those words over and over again, it struck me that I’m neither a Hamilton nor a Burr. Hamilton would certainly feel like I worry too much about how I express something and what the impact on those around me will be. Burr would certainly feel like I share too much and give too much ammunition to my enemies. I’ve got a little bit of both Hamilton and Burr in me; I’m a Talk More / Smile More woman. At various points in my life, I’ve worried about that. I’ve been counseled to be a bit more like Burr — closing myself off and protecting myself from those who would harm me. But, I don’t really know how to live that way. Instead, I decided to lean in and write a blog that is unapologetically like Hamilton, who wrote voraciously and likely would have enjoyed the idea of direct communication of ideas with anyone who would listen. But, Hamilton also notoriously wrote an open letter to the editor about his marital infidelity, giving his wife no warning and letting her face the brunt of the impact alone. I couldn’t do that. My story is my own, other people get shared only with their permission. Talk more, smile more might not be a catchy slogan for a musical or a political campaign, but I like it. Perhaps Miranda’s characters are not as archetypal as the story would suggest. None of us really are. But the historical truth is that they met each other on a field with pistols drawn because of some fundamental difference of opinion or character. They believed that the differences couldn’t be resolved without violence. I see a lot of that now, people believing that we can’t resolve differences of opinion or character without violence. It makes me sad. I cry every time I listen to the song as Hamilton dies, “The World Was Wide Enough.” We don’t need to create the false choices — us or them, you or me. Hamilton and Burr were on the same side and still they found a way to be on the opposite sides of a field at dawn. Our country lost two great minds, one to death and one to villainy. What a waste. So, let’s talk more and smile more; instead of a duel, let’s have a picnic. Whenever I am holding on by the barest of threads I think of Peach. Most of the time I’m focused on mental grounding. I take a deep breath and consider the many things in my life that make me happy: my family, my friendships and my contributions. I recall a handful of my best memories, the ones that I have watched so many times that research would say they aren’t even real anymore, just a revisionist glimpse of history. Sitting in the middle of the crazy I find a way to reboot my brain to thankfulness. But sometimes, a couple of times a year, I actually go to a happy place. One of the places that are unique in their quiet and lack of expectations. A place where showering is optional, where I can sit without interruption for minutes or hours or a day. Where waking up in the morning is based on the rising of the sun or the lapping of water on the side of the boat, not on an alarm. I love those places. And as I sit in one of them now, sipping a beverage and reflecting, I find myself wondering if being middle-aged has helped me find it. Is a happy place an idea reserved for people of a certain age? Or, was I just slow to grasp it? I don’t recall feeling the need for this as a child. In fact I remember that sitting still in one place (especially a familiar place) with no expectations or plans was boring. Really, really boring. That point of view is validated by my own children who have perfected the refrain, “We’re doing that again?” Complete with the nasally whine any parent would recognize. As a young adult, I sought adventure. I wanted to see the world and understand my place in it. I couldn’t catalog new experiences fast enough, throwing myself into whatever activities I could. Pack up the car, jump on a plane, take any work travel assignment. When I couldn’t study abroad in my MBA program, or when I saw someone else do something cool that I couldn’t do, I felt regret and envy. Like I was missing out on something, some wonderful experience that I would never get to have. I can’t know yet how I will feel later in life, as I look back on more and look forward to less. I see people who are resigned to aging and sit quietly waiting for the end, unable to enjoy the happiness a life well-lived has earned them. I see people frantic to squeeze in one more adventure, whether or not their physical bodies are able. I see people who isolate themselves and people who surround themselves. I see fewer people in their happy place than one would expect, given all of us are desperately trying to get there. And maybe that is why I enjoy the quiet of my happy place. Maybe it is because I am aware, in this moment, of the gift I have. I can just sit here on a porch swing in the early morning sun, listening to the sprinkler water my mother-in-laws beautiful garden. I can hear a power saw and a hammer in the distance, two separate projects underway that are not mine. 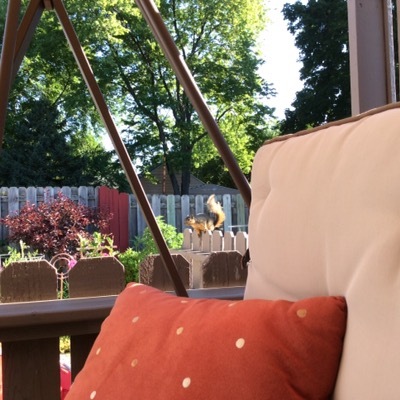 I can watch as a squirrel, cheeky fellow, pops right up on the fence and looks at me, demanding that I interrupt my writing and take his picture. I’m glad that I’ve found my happy places — this swing, the back of my sailboat and my deck. I appreciate them for what they are: an oasis of rejuvenation and recharge in a world of crazy expectations and an always on life. It took me years to understand the need and to name them; it took me even longer to claim their value. Now that I have, I hope that I don’t forget. I don’t mean to make light of addiction, but work is pretty much the only thing I’m addicted to. There’s something so inherently rewarding to me in doing work well that I get a bit of a high when it happens. I work so hard to get that feeling that I succeed, which results in me being assigned more challenging tasks. Then I have to work harder to feel the same sense of accomplishment, the same high. It’s a cycle that can drag you downward into a spiral, until you’re burnt out and a frazzled shell of your former self. I’ve been working for more than 20 years and I don’t think I’ve left a single day of vacation on the table. Not when I started as an administrative assistant and not now as I’ve moved into leadership. Left to my own devices, I very well might have. I can see myself finding reason after reason for why the work had to be done, why I couldn’t walk away for even a day. I’m an addict and I’m better at rationalizing work than most other people I know. Like most addicts, when I am explaining why the work has to be done — and why only I can do it — I am passionate, articulate and compelling. I am confident I would convince you. But I can’t convince my husband. It’s yet another thing in life that I stumbled into without any sort of planning. I didn’t pick a husband by intellectually saying, “Oh, he’ll provide great balance. He’ll make sure I ratchet back from 5th gear every once in a while. He’ll make sure I take my vacation.” Nope, I just got lucky. Somehow over the 20 years we’ve been figuring out life together, I moved from just doing it because he made me to realizing that I don’t just like vacation, I need it. I need a chunk of time when the alarm doesn’t go off, when the responsibilities of driving progress is on someone else’s list. Not mine. It helps me recharge my weakened batteries and fight off the addiction cycle. I am fairly certain that if I hadn’t taken all my vacation when I was a newbie in my career I wouldn’t be taking it now as a leader. And in a country where they say people take half of the paid vacation they are entitled to that is a real problem. Teams where leaders don’t take vacation set a tone that you can’t take time off and get ahead. It leads to burnt out teams and decisions not to invest in the systems and processes that reward cross-training and back-ups. If the world comes to a blazing stop when a leader is out of the office — if all paths go to one and only one person — then a team really isn’t a team. One of the reasons I love vacation is because I can send the message to my team that I trust them to take care of things without me. That I believe they have the training, judgement and competence to make decisions without me. And I believe that if they really do need me they will interrupt me quickly for a bounce or confirmation. I believe that effective work teams, like those in sports, have to be prepared for people to sub out. No one can play all 60 minutes of a hockey game, no matter how good they are. And even if they could, they can’t do it and stay great. The best teams are capable of having someone out for a play or a game or a season and winning anyway. So, take your vacation. Make sure your people take their vacation. Build your team embracing those self-healing capabilities not fighting them. For you and for everyone on your team. Especially if you’re a workaholic, too. It’s a Saturday in mid-May which means that students all across the northern hemisphere are busy graduating. Last year I celebrated my 20-year college reunion; this year I celebrate 25 years since I graduated from high school. Looking back, I have a lot of emotions and critique but only one major theme. Boy, did that girl take herself seriously. I spent most of my high school career pegged as the ‘smart kid’ and looking back at my top ten essay it is clear I carried it around as both a cross and a badge of honor. I picked the DesCartes quote “I think therefor I am” as my lead in and sanctimoniously described my enlighten point of view. I was so sure I had everything figured out. But don’t take my word for it, read it yourself. The problem is that in high school I spent a lot of time wishing I was someone else. I wanted to be cute or popular. I wanted to be in student government or on the cheerleading team. I wanted boys to ask me out and girls to pick me first for Powderpuff football. Even when I graduated and went out into the world a part of me stayed stuck in the halls of high school desperately wanting to be someone else. When we had our 10-year reunion I was still so focused on proving that I should have been something different that I let myself get sucked back into the drama. I showed up convinced I would be the prodigal daughter returned. Everyone would realize what a huge mistake they made because now I was pretty with a handsome husband and a beautiful baby. I’d graduated from two strong schools and had a great job. I was ready to be embraced and when I wasn’t I took it personally. I raged against imagined slights and rebelled against the very idea of reunion. I’m not sure what happened or when, but at some point I realized that 13-18 year old kids all take themselves too seriously. Maybe it was having kids enter that age and seeing a bit of myself in them. Maybe it was finding some old artifacts of that time and looking at myself from a distance. Maybe it was just getting older and realizing that I like a lot of people now that I wouldn’t have been friends with then and asking the question: why? Because I was taking myself too seriously, that’s why. The girl I was then saw honest-to-God boundaries that couldn’t be crossed. In her mind they were as real as a wall or a barbed wire fence. There were consequences for wanting to be something you weren’t or stepping across a line where you didn’t belong. Serious consequences to reputation and happiness. In her mind at least, which was all that mattered. Of course, that was all crap. It was manufactured seriousness to help kids get through the hard work of growing into adults. Now that I am taking myself less seriously, I’m open to reaching out to the women who had what I thought I wanted. They are warm, caring people. Strong fascinating women that I wish I had known better when we spent five days a week together. I am a better person now because of our friendships, even if it is limited to an IM chat or a phone call. And taking myself less seriously is a lot more fun. I can laugh at myself and the silliness of the situations I find myself in. I’ve come to appreciate that empathy is more important than intellect. And, probably most important, I’ve learned to embrace the things that make me who I am and let go of wanting to be someone else. I’m the smart girl who knows what she wants and isn’t afraid to get it. It’s the first day of May and I have to admit something. I hate being cold. And the only thing I hate more than being cold is being wet and cold. Which makes it hard to be positive when you wake up to a forecast like I had yesterday: high of 48 degrees and 100% chance of rain. I tried to just go about my normal life and ignore it, but it didn’t work. I spent the whole day cold to my bones, miserable and uncomfortable until I got home into my flannel pjs. I’ve always been partial to warmer weather, but my hatred of the cold emerged during the summer I was a camp counselor. In the northern forest of Michigan, they were short of lifeguards and as a lifelong swimmer I thought it would be an easy way to make some extra money. So, I signed up for the required lifeguarding class and settled into a new training routine. I was nineteen years old and had grown up loving the water. If our high school had had a swim team, I have no doubt I would have joined it. Absent that, a childhood of recreational swimming left me more than capable in the basics and I held my own with the class. I leaned into the hardest pieces — deadman drills, escaping from a panicked drowning victim — and focused on building my endurance. It was fun, but it wasn’t easy. By the time we got to our 500 yard stroke test, 100 yards of five different strokes, I was feeling more confident but still worried. I was so focused on showing the instructors I could do what they required that I didn’t pause to think about whether I should do what they required. I didn’t stop to ask any questions when we stepped into the water, one after another, and started swimming. It was cold, really cold. But I pushed myself to swim and managed to finished it, shaking uncontrollably by the time I pulled myself out of the lake. I only started to worry when, wrapped in a towel on the dock, I heard a faint voice calling for me. One of my friends was standing in the knee deep water on the side of the dock physically unable to pull herself out. In my own weakened state I struggled to help, but together we managed to get her onto the dock. None of the instructors seemed to notice, so I just got us into the fire-warmed cabin. We huddled with everyone else in the blankets they had suggested we bring. The whole class sat there, each of us working hard to warm back up. It felt like any other camping moment until I looked over and watched one of the male counsellors tip over. Literally, tip over. A buff African-American man, a body-builder with almost no body fat, he had passed out and almost fallen into the fire. The instructors, woken up to the situation, mobilized. Suddenly, one of them was hovering over me asking me questions. My teeth were chattering so badly I could hardly speak. In a matter of moments, my friend and I were assessed as the worst afflicted of the women. We were driven on a golf cart to the first aid station where they took our temperatures. I argued that since I could walk and talk that I was fine — finer than my friend. But my temperature was lower and so they put me in the bathtub. In my memory they told me my temperature was 95 degrees, but that is so cold I must be remembering wrong. It was a long time ago. I do remember that it took me awhile in that tub to get back to a safe temp. It took another long shower to feel human again. But the funny thing is that by the time I called my parents from the camp pay phone that night, I shared the story as nothing more than an amusing anecdote. Later, when our instructors shifted us out of the water and to classroom instruction it was just a sidebar — and the irony that we went into a section on hypothermia was hilarious. It didn’t take us long to realize that it wasn’t funny. That we needed to understand the risks and signs of hypothermia. That leading 20 teenagers into 54 degree water for a prolonged swim test was not just an example of poor judgement, but that it could have had serious results. I think about it now as a parent, wondering how I would feel if I learned that something similar had happened to my daughter. Nope, not funny. A long time ago, I read an article stating that there was a long-term impact of hypothermia and heat stroke trauma on individual’s ability to regulate their own temperature. It was the first time that I felt like my hatred of the cold wasn’t a complete cop out. Fortunately, at this point (whatever the science) I don’t feel the need to apologize for it. So, on the first day of May I wore long underwear and fleece and spent a big portion of the day on the couch under a blanket. It may be wimpy, but it is what it is. And that’s why you’ll find me on the beach — not on the slopes. I turned 43 today. I know there is some societal expectation that women don’t talk about aging, but I’ve never subscribed to it. When I was 25, I assumed it was because no one complains about being young and that at some point I would hit an age when I would fall in line and start being cryptic. Well, I’m 43 and I haven’t hit it yet so maybe I won’t. Because I honestly love birthdays. Everyone’s birthdays, but especially mine. My birthday represents the ultimate reminder of persistence, a time for reflection and a slowed down moment to be connected with the people who matter to me. And those are all things that bring me great joy. You see, I wasn’t supposed to make it through my first week of life, much less 43 years. I’ve shared my origin story before so I’ll simplify it now: I was born too early and too small in a time when technology was less sophisticated to care for premie babies. My grandfather looked at me and said, “I’ve shot rabbits bigger than that.” The doctor told my mother she was young and could have more children. So, while I don’t remember my first birthday, I imagine that it was quite the celebration. The simple act of making it to another birthday is the first gift I open each year. I am here, upright, with breath in my lungs and beats in my heart. A close friend lost his wife to cancer before she reached her 45th birthday. Another close friend is living with stage four cancer now. Somehow, I am here living in what I believe is my prime. I love being in my 40’s when I am still strong and vibrant and capable — despite a few more wrinkles and jiggles. I don’t think I would go back, even if I could. My second gift is taking a moment for reflection, giving myself time to consider what the last year given me. This year, I watched my teenage daughter find her own way in high school and she let me join her on the journey; I can see the shimmering outline of our adult relationship in the way we acted last year, and there isn’t much cooler than that. As my husband and I watched other marriages struggle, we doubled down on each other — talking intentionally about what our relationship meant to us, traveling more and going on dates. At work, I leaned into my leadership role by taking on new challenges and building new relationships. And then there’s Too Much Mel — last birthday, I was just Mel. And, if those two gifts aren’t enough, all day I will get messages from friends and family across the globe telling me “Happy Birthday!” Sure, cynics will say that a Facebook birthday wish isn’t real, but I disagree. At 10:26am on my birthday, 65 people had taken time out of their busy day to write something to me. Sure, Facebook makes it easy, and it only takes 15 seconds to type a “Happy Birthday” in the box, but it was time and time is precious to us all. I respond to every single message I get, smiling each time about the memories it brings to light. From cousins to kindergarten classmates to people I worked with three jobs ago, it all means something. So, I’m 43. I may get presents or cards today or I may not. Whether I do or don’t doesn’t really matter because I already opened my three most important gifts: persistence, reflection and connection. Let’s hope I get the same things again next year.